This quartz time and tide movement tells you both the time as well as tide! It has the ability to run the standard hour, minute and second hands as well as a tide hand. 3/8" threaded shaft for up to 5/16" dial thickness. 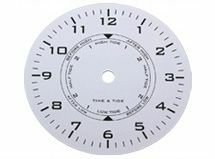 White time and tide dials are available in 6" and 7 7/8" diameters. Price includes choice of one set of hour and minute hands and one of the red indicator hands shown below. Clock hardware is included. FREE CHOICE of over 40 pairs of hour and minute hands and two different red tide hands is included. You just have to tell us what you would like. See the link to clock hands at the bottom of the movement page. Please do not assume that any clock hands you have will fit, as the mounting holes are not standardized. Mounting hole sizes and shapes are shown at the top of the clock hands link. If you do not choose a FREE pair of hands with your movement purchase and later decide that you need them, there will be a $5.00 charge for us having to make a second shipment. These American made movements will operate a second hand, but second hands are considered optional. See the bottom of the movement page for the link to our selection of second hands. Both models have a 7/16" shaft diameter so a 1/2" mounting hole is the correct size to drill in your case.